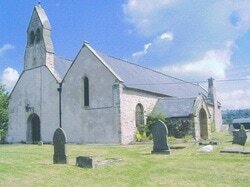 St.Garmon's Church is a very ancient foundation. By the 9th century St Garmon was identified with St Germanus of Auxerre who visited Britain in 429 AD. In the 15th century another nave was added to the original church and in 1773 the stone arches dividing the two naves were replaced with the present magnificent oak pillars. Part of what is believed to be the shrine of St. Garmon, a memorial to Gruffydd ap Llywelyn ap Ynyr 1320, and to Sir Evan Lloyd 1586, with rare Welsh inscriptions are in the south aisle. There is also a fine medieval candelabra and parish chest.